With renewable energy a major opportunity across the globe we have seen a large rise in the production of wind-turbines. The largest of these turbines are of a huge scale and can have blades of up to 50m in length. The erection of these turbines, whether solitary or as part of a wind farm, is a major undertaking. The heaviest part of the windmill is the nacelle often weighing 22t – 90t depending on the size of the units, and this may need lifting 100m in the air to be fitted. This is where the new generation of crawler cranes comes into its own. Our client sent us their requirements knowing that this would be the largest crawler crane to be supplied to East Africa. We purchased the crane on their behalf and managed to negotiate interest free payments over 24 months. 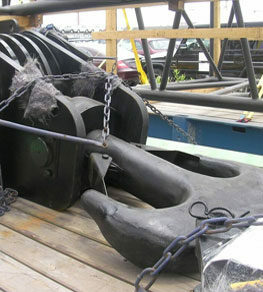 The whole crane was then painted to match the clients brand colors, and the logistics of shipping began. The crawler crane unit, known as the QUY260, weighs 210 tonnes and can lift 260 tonnes to a height of 110m thereby providing the capacity to build the biggest wind-turbines across East Africa. 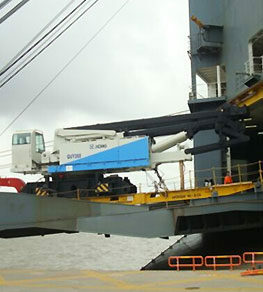 The body of the crane is 48m long, and required specially designed trailers to be towed onto the ship to Kenya via Mozambique. 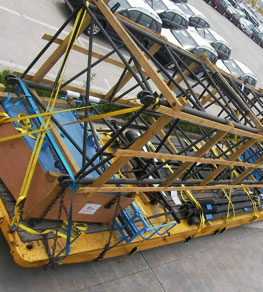 In total, we required 19 of these trailers to get the crane components to its destination. Once in Kenya, a team of Chinese supervisors trained the Kenyan workforce to use the crane. 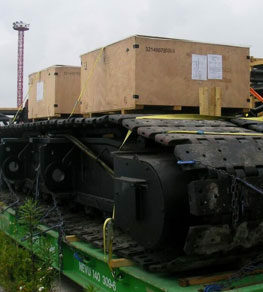 This may have been one of the most challenging logistical briefs we have received to date, but Source Supply ensured the fulfillment was precisely according to requirements and on time.